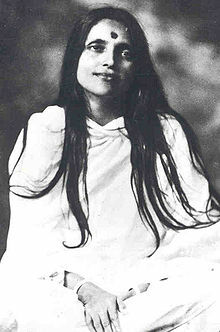 Sri Anandamayi Maa (Bengali: শ্রী আনন্দময়ী মা) (30 April 1896 – 27 August 1982) was an Indian saint from Bengal. Swami Sivananda (Divine Life Society) described her as “the most perfect flower the Indian soil has produced.” Precognition, healing and other miracles were attributed to her by her followers. Paramhansa Yogananda translates Anandamayi as “joy-permeated”. This name was given to her by her devotees in the 1920s to describe what they saw as her habitual state of divine joy and bliss. Anandamayi Maa never prepared discourses, wrote down, or revised what she had said. People had difficulty transcribing her often informal talks because of their conversational speed, further the Bengali manner of alliterative wordplay was often lost in translation. A devotee, Brahmachari Kamal Bhattacharjee, however made attempts to transcribe her speech before audio recording equipment became widely available in India. A central theme of her teaching is “the supreme calling of every human being is to aspire to self realization. All other obligations are secondary” and “only actions that kindle man’s divine nature are worthy of the name of actions”. However she did not ask everyone to become a renunciate. “Everyone is right from his own standpoint,” she would say. She did not give formal initiations and refused to be called a guru, as she maintained that “all paths are my paths” and kept saying “I have no particular path”.